Geoffrey Castle has been putting on a must-see Christmas event for ten­­­ – going on eleven­ – years right here at KPC. 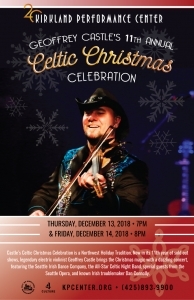 The legendary electric violinist’s annual concert has become a Northwest holiday tradition and always features special guests. This year’s show includes: the Seattle Irish Dance Company, the All-Star Celtic Night Band, special guests from Seattle Opera, and known Irish troublemaker Dan Connolly. Plus, the annual celebration is known to feature surprise guests as well! It is sure to be a magical (and sold out) live concert to start the holiday season out right. Click here to learn more about these sold out performances. StoryBook Theater is excited to announce their NEW holiday show this season. 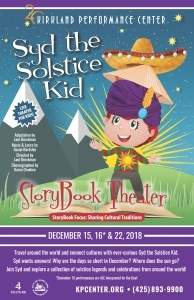 Syd and her three friends explore winter solstice stories from Scandinavian, Inuit, Chinese, and African cultures and act out the ancient stories that these cultures told about the disappearing sun. This show intends to build awareness about other cultures and shows how our traditions, like decorating and gift-giving, came to be. Each December, this show will return with new cultural stories. Click here to get tickets! 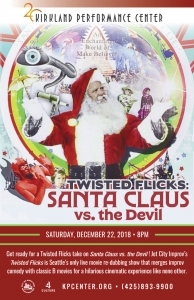 December 22 @ 8:00 p.m.
Jet City Improv is back at KPC for a new edition of Twisted Flicks this holiday season! The film Santa Claus vs. the Devil was originally a 1959 Mexican fantasy film, before it was re-dubbed into English in 1960, where Santa must battle a devil that was sent to Earth to make the children do evil. Twisted Flicks is a sure-to-be-hilarious show where the improvisers create an all-new dialog for the movie characters, make sound effects, and feature live music. This is a funny and fun holiday activity for the whole family, ages 10 and up. Click here to get tickets!